Prussia, Austria and Russia had all had their share of French expansionism, and the British concept for the Netherlands, as a part of the redrawing of the European map, had gained their approval in general terms. Further negotiations, however, gave rise to quite a few difficulties. Austria, which had held the sovereignty over the southern Netherlands until 1794, had little desire to regain these remote territories and preferred to be compensated with Italian lands along its own border, something which was relatively easy to settle. Prussia however had its own quite ambitious expansion plans: it wanted to have the largest possible part of the lands between the Meuse and the Rhine, which lands were still claimed by Sovereign Willem with like ambition and determination; it further wanted Willem's hereditary Nassau lands, which the owner by no means intended to cede. What was more, the Prussian Chancellor Prince Hardenberg argued that the Netherlands should become a member of the newly created German Confederation-a claim by the right of arms, as it had been mainly Prussian troops that had pushed the French out of the Netherlands. Incorporating the new state into the German Confederation would allow the Prussians to place it under their military supervision, something which they felt was much needed: by their standards the Netherlands military efforts thus far had failed to impress. As Plate 2 shows, Willem's ambitions were not exactly modest either; putting them into effect would mean that Aachen, Köln and Koblenz would become Netherlands towns. For Britain, as always trying to achieve a balance of power, the expansion of Prussian influence as far as the North Sea was as unwelcome as the idea of the harbour of Antwerp being in French hands. Prussia needed to be sufficiently strong to be able to withstand any French aggression in the future, but not to a degree that would allow it to dominate its neighbours. Consequently Castlereagh supported Willem's aspirations to a certain extent. The Russian Tsar Alexander had his own particular reasons to do the same: he saw Willem's eldest son as a possible wedding candidate for his sister, Anna Paulowna. After the peace of Paris at the end of May 1814, Castlereagh and Hardenberg reached an agreement in principle on the Meuse-Rhine area; it would fall largely to Prussia, which in return would abandon its claim on Willem's German lands. The Netherlands Sovereign, not at all content with this compromise, resisted strenuously but unsuccessfully. No settlement had yet been reached as to the strategically situated Grand Duchy of Luxembourg, comprising the present state of Luxembourg and the Belgian province of that name; it was still claimed vigorously by both Prussia and the Netherlands. Talks continued in London in June and July, at the beginning of which Britain, Russia, Austria and Prussia agreed officially on the unification of the northern and southern Netherlands under the hereditary rule of the House of Orange. Pending definitive settlements at the Vienna Congress, due to start that September, Willem was to take control of the southern Netherlands; on 16 August 1814 he was appointed Governor-General over these territories. PLATE 3: Willem Frederik van Oranje-Nassau (1772-1843), son of the last Republican Stadhouder Willem V; Sovereign from 1813, and from 1815 to 1840 King Willem I of the Netherlands. This painting by J. Paelinck was probably made shortly after the 1815 campaign; the King's finger above the map points to Waterloo. He wears the uniform of a general, with the decoration of the Order of the Garter. The Congress of Vienna At the Vienna Congress Netherlands interests were represented by Lord Clancarty, the British ambassador in Den Haag. The Prince had given him a map on which his territorial aspirations were displayed. Now that Britain and Prussia seemed to have come to an agreement on the Meuse-Rhine area, his claims here had become slightly more modest, but he strove persistently to gain a considerable strip of land on the east bank of the Meuse to keep the Prussians at a distance. In addition, a corridor along the Mosel had to guarantee a free passage to his Nassau lands, thereby linking them to the Netherlands. From September to November 1814 the Congress dragged on without any agreement emerging even on the procedure of the talks. By December the atmosphere started to deteriorate badly and by January 1815 the allies were even on the brink of going to war amongst themselves, with Prussia starting to mobilize its army against Britain, Austria and France on New Year's Day . On 3 January these three nations formed a secret alliance, designed by Britain, against Prussia and Russia. Willem found himself placed in a very difficult position when he was invited to join in; he did not want to offend Austria and particularly not Britain. On the other hand it he found it dishonourable to conspire against Prussia and Russia, whose armies had been the first to support his country when it was trying to liberate itself. Furthermore the Prussian King was his brother-in-law; their relationship was not outstanding, but Friedrich Wilhelm had after all looked after him and his kin in difficult times. Willem delayed as much as he could, but eventually the Netherlands envoys signed the secret treaty-he would not bet on the wrong horse again. However, by February things had calmed down and it did not come to war. The Sovereign's willful and sustained efforts to have the Netherlands' territory enlarged in an eastern direction remained in vain. The compromise which the allies finally reached decreed that he was to lose his hereditary lands in Germany, for which he would be compensated with the Grand Duchy of Luxembourg; the Grand Duchy, however, would not become an integral part of the Netherlands , and moreover it would become a member of the German Confederation; finally, along the east bank of the Meuse only a very modest strip of land was added to the Netherlands (see Plate 5). Willem refused to accept, but ultimately would have no choice but to concede. On 28 February 1815 the Staatscourant (Gazette) reported that the Vienna Congress had reached an agreement in principle on the unification of the northern and southern Netherlands under the hereditary royalty of the House of Orange. The settlement would be implemented after the signing of the concluding protocols . Before it came to that, however, Napoleon escaped from Elba and landed at Fréjus in the south of France on 1 March 1815. In the days that followed, Napoleon's triumphant march through France made it clear that the Emperor had lost nothing of his charisma-quite the contrary. 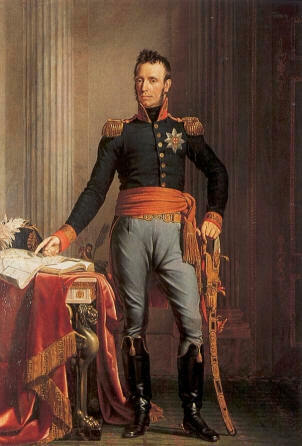 On 11 March the news of Napoleon's return reached the Netherlands; Willem decided that this was enough reason to adopt the king's title without further ado, and seized the opportunity to do so: on 16 March 1815, while Napoleon marched his growing army through Lyon and on towards Paris without having to fire a single shot, William was proclaimed King of the Netherlands and Grand Duke of Luxembourg . Next day the Netherlands army was mobilized and shortly after that King Willem left for Brussels to take measures to bring his young state onto a war footing. PLATE 4: The Prussian ideas about the territory of the new Netherlands state, as formulated by chancellor Hardenberg on 29 April 1814. In these plans the Netherlands would become a member of the German Confederation. Comparison with Plate 4 clearly shows the conflicting territorial aspirations between Prussia and the Netherlands. Yet there still was a sizeable body of French troops under General Molitor near Utrecht, while the military force over which the provisional government could dispose was negligible. This became evident on 23 November when the town of Leiden, having recognised the provisional government, tried to improve its military position by seizing the small town of Woerden, some 15 kilometres from Utrecht. A force of 250 men commanded by General de Jonge and Colonel Tullingh of the National Guard (now renamed Oranje-Garde) managed to occupy the objective without much trouble. Molitor, however, saw this action as an unfavourable shift in the status quo and responded by attacking the town on the following day with 1600 men. After two hours of fierce combat the Dutch troops were compelled to either surrender or withdraw. In the events that followed the French killed 26 civilians and wounded several others. This caused great anxiety in towns that had also recognised the provisional government, and military assistance from the Allies was now felt to be urgently needed. But help was approaching: one day earlier on November 23rd, Prussian troops under General von Bülow had crossed the border with Germany and by the 24th had seized the towns of Doesburg and Zutphen. On 27 November, Molitor started to withdraw his troops from Utrecht. The next day Narishken's Cossacks reached Den Haag, and the town was further reinforced the day after when 200 British marines landed on the beach of Scheveningen. Even had the British still harboured any reservations about Willem Frederik, they were left with little choice after two envoys sent out by the provisional government located the Prince in London and officially invited him to return to the Netherlands . On 30 November 1813, the Prince followed the British marines and landed at Scheveningen - the same place where he had left the country 18 years before. Upon his debarkation the crowd assembled on the beach welcomed him enthusiastically with cheers of "Long live the King!" and the provisional government immediately offered him the title of King. He declined for he did not favour the emerging prospect of a constitutional monarchy to be a king bound by a constitution which he had not written himself. Initially his preference had been simply to become the next Stadhouder, Willem VI, leading an improved federal government with more personal power. No doubt he also had the British plans for the Netherlands in mind: by prematurely accepting the title of King he might offend the other ruling European dynasties and thus waste his opportunity for a considerable territorial expansion -an expansion against which, as far as the southern Netherlands were concerned, the other Allies seemed to have no objections, but which still needed to be worked out and ratified. After strong persuasive efforts by the provisional government and other politicians, the Prince agreed, as a compromise, to accept the title of Sovereign of the United Netherlands - not Stadhouder Willem VI, but Sovereign Willem I, a title which was soon thereafter recognised by the Allies. Meanwhile the military situation was improving significantly in the other parts of the country as well. Prussian troops took the town of Arnhem on 30 November after bitter fighting, and by December 1813 the bulk of the French troops had vacated the country north of the Meuse, apart from the towns of Gorinchem, Deventer, Den Helder (the Dutch naval port), Coevorden, Deventer, Naarden and Delfzijl. Gorinchem fell in February, the other towns would remain occupied by French garrisons until April and May 1814. PLATE 5 "New map of the Kingdom of the Netherlands and the Grand Duchy of Luxembourg," an engraving from 1815. 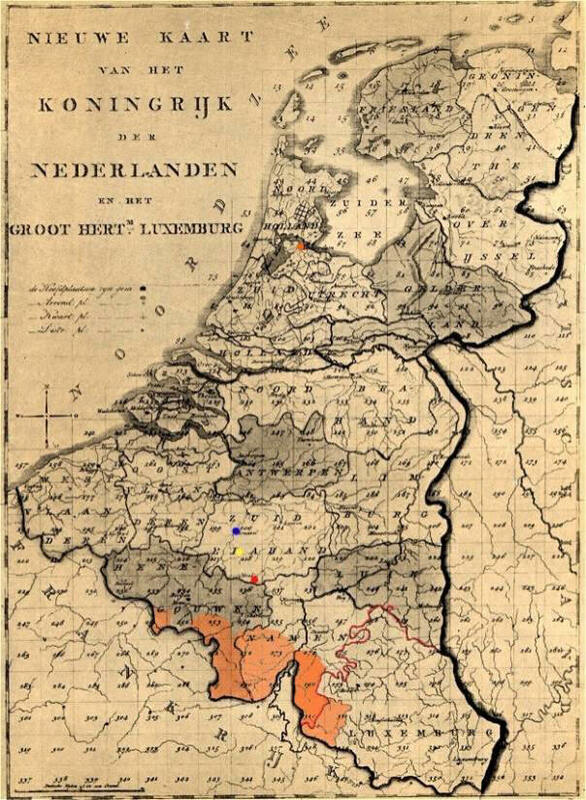 The red mark indicates Les Quatre Bras, the yellow mark Waterloo, the blue mark Bruxelles and the orange mark Amsterdam. The Grand-Duchy of Luxembourg, below right, did not become an integral part of the Kingdom; its border with the Netherlands is marked red. The orange areas in the south were ceded by France at the Second Peace of Paris in November 1815-after the Waterloo campaign. 1) The main reason for the conflict was that Britain and Austria insisted on involving the new French regime, represented by Talleyrand, in the decision-making process. 2) Willem I would become King of the Netherlands and Grand Duke or Luxembourg. This construction was referred to as the Personal Union. In practice Luxembourg was governed as if a Netherlands province; Willem tried very hard to negate any Prussian influence. The Personal Union would last until 1890. 3) The Vienna Protocols were signed on 9 June 1815, one week before the battle of Les Quatre Bras. 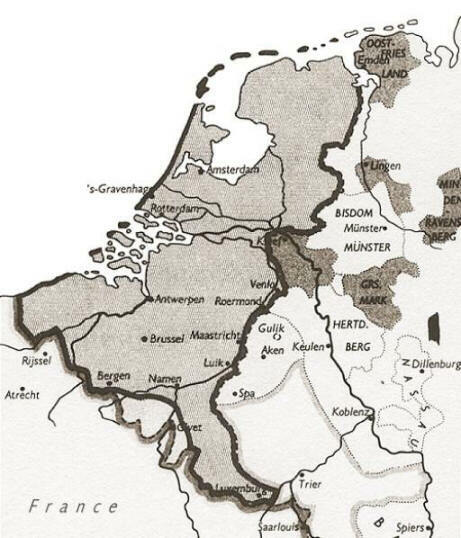 4) The proclamation declared that all the lands under Willem's sovereignty now constituted the Kingdom of the Netherlands. F. de Bas: Prins Frederik der Nederlanden en zijn tijd, Vol. II, Schiedam 1891 J.A. G. van Uythoven: "Waterloo Campaign: Nassauers in Netherlands Service" article published in The Age of Napoleon No. 34, Leigh-on-Sea 2000 W.E.A. "The Crossroads Part I" is mainly based on the works of Vels Heijn and Hofschroër mentioned above. Regrettably Vels Heijn's book has not been translated into English.